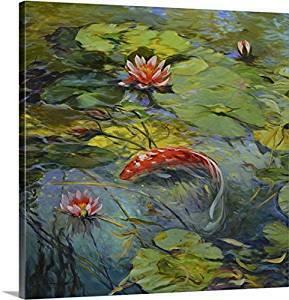 Feng shui pictures, paintings, prints, statues, and figurines are examples of the artwork you can find online. Artwork that reflects feng shui principles promotes auspicious chi while adding a sense of peace and beauty to your home's environment. There are several feng shui tips you want to follow when selecting artwork for specific rooms in your home. Each piece of artwork you add to your home decor should be a thoughtful reflection of feng shui principles while also a representation of your personal style. Select artwork for the foyer that is positive and welcoming to all who enter your home. 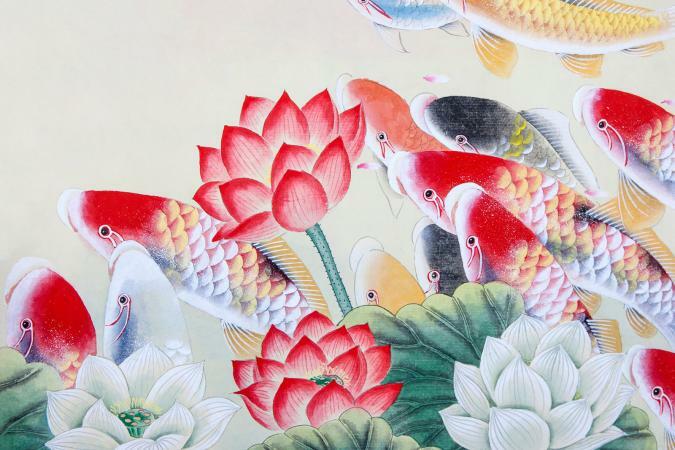 You can select auspicious art that mimics koi fish in a pond or aquarium. A statue of the Buddha facing the door offers blessings and greetings. The living room is where the family congregates and filled with high yang energy. Art should reflect these activities and reflect happiness. 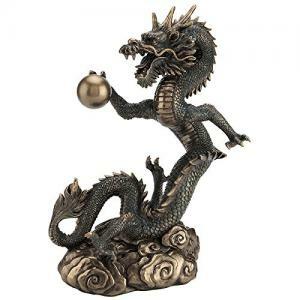 You can further enliven the yang energy with sculptures and figurines of animals, such as playful dolphins, three-toed frog (abundance and wealth) or a trumpeting elephant (success and abundance). The kitchen is an important room in your home where the nourishment of your family takes place. Food related art is always a good choice. Plaques, posters, paintings, photos and art objects can be selectively placed in this room. The dining room is the most important room in your home. All abundance and healthy energy is generated from this room. Classic art of still-life paintings of wine and bread aren't the only choices you have for dining room art. You can select art that shows abundance and happiness, such as baskets of fruit, either a painting or hand-crafted art objects to place on the dining table or buffet. The home office should be treated as a professional arm of the family wealth and abundance. You can choose specific art to improve and attract an auspicious career or business. Water features are always a good choice of art in this room, such as a photo or painting of a cascading waterfall. The master bedroom can also become a vital feng shui resource to promote a happy marriage and good romantic relationship. Through artwork, you can attract auspicious chi energy to gernerate a stronger martial bond. Some of these themes include, art of pairs, such as birds, flowers and other feng shui symbols. Encourage your children to grow and learn with good feng shui art applications. Some of the subjects for artwork, include symbols of education and academic sucesss, such as a crystal globe. Use your child's Chinese astrology animal in art to reinforce the energies of its influence. Welcome guests with art objects that communicate your hospitality through feng shui auspicious guidelines in bedrooms. The subjects that convey hospitality include, pineapples, magnolia and peony blossoms. Bathrooms are notorious for suppressing the luck sector where they are located. Consider the compass location of your bathroom to guide you in selecting art objects made of the element that can counter this type of energy suppression. For example, a bath located in the north (water element) sector can negatively impact your career, so select art made of the destructive cycle element of earth to counter, such as pottery and ceramics. The laundry room is another room where waste water is generated and expelled from the home. Choose art made of crystal or stone to attract wealth energies and counter the inauspicious waste water energy. Enhance each life area using artwork that will attract the energy you desire. The bagua divides your home into sectors that correlate to various areas of your life. Follow either the Black Hat Sect Feng Shui (place over layout of house) or Compass and Form Schools of Feng Shui (using compass directions to determine placement of bagua) for placement tips. Whichever school of feng shui you use, you can take advantage of the chi energies attracted to each sector. Located in the southeast sector (wood element) of your home, you can enhance this area of your life area using pictures and symbols of objects and animals. Never use water elements in a bedroom, since this creates too much energy and disturbance to rest. Peacock: The peacock is perched on a limb displaying it radiant feathers. There are many choices for this artwork. Enhance your relationships using energy in the southwest sector (earth element) of your home. Carved amethyst artwork is an excellent activator for the chi energy residing here. Health and family energy is located in the east sector (wood element) of your home. There are many symbols for health and longevity. 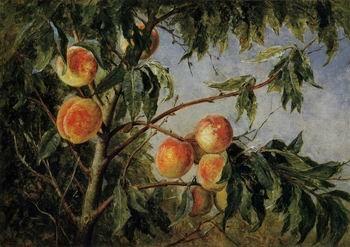 Basket of fruit: Fine art hand painting with an elegant frame. Located in the west sector (metal element) of your home, this sector represents and affects your descendant luck. This directly relates to your children and any creative energy in your life. It symbolizes the birth of your own joy and spirit of life. Images rich with imagination and creativity are excellent additions to this area. Artwork placed in a child's rooms should always be happy and uplifting, evoking feelings of confidence, inspiration, and encouragement. Knowledge is located in the northeast sector (earth element) of your home. Enhance this life area of self-cultivation with various symbols and images. Activate happy occasions with energy located in the northwest sector (metal element) of your home. Art that showcase happy people or happy occasions are the best choice for this area of the home. Images of gods, angels, or strong powerful people work well in this area. An essential aspect of using art in feng shui is knowing the correct subject matter and proper placement of the feng shui art and the bagua of each piece. Used correctly, artwork attracts the free flowing positive chi energy (sheng) into and throughout your living and work environment. Many feng shui practitioners use the bagua diagram to determine the correlation between specific areas of the home and the nine areas of life. Practitioners choose and place artwork specifically to enhance a feng shui life. Artwork can also incorporate the five elements and the feng shui colors associated with each compass sector. For example, bedroom art should only depict happy events, objects, and animals, and should always be in pairs. Photos of you and your mate are appropriate while photos of others, especially children, aren't meant for the master bedroom. Another example is office art. You want to enhance your work environments, improve your job performance, and ensure a successful career with excellent pay by adding art and art objects to your office, especially on the north wall with elements of water and metal. Using feng shui in various forms of art is a wonderful way to activate elements and enhance the chi energies of each sector in your home. These objects are not just feng shui remedies and enhancers; they should also be works of art that speak to you and bring you joy each time you look at them.